Easter is just around the corner, and I am really looking forward to it! With warmer weather, more chances to get outside, and family fun dyeing Easter eggs, Easter evokes wonderful memories from my childhood. I hope to create new, special memories with my own kids as well. To get in the Easter spirit, I have updated my Easter Printables Pack! 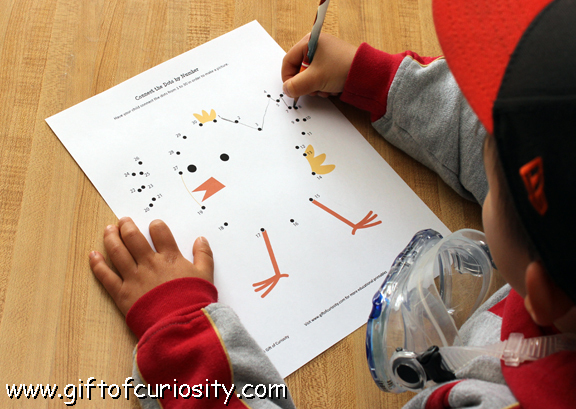 Note: This and other Easter ideas can be found on my Easter activities for kids and Easter printables page. 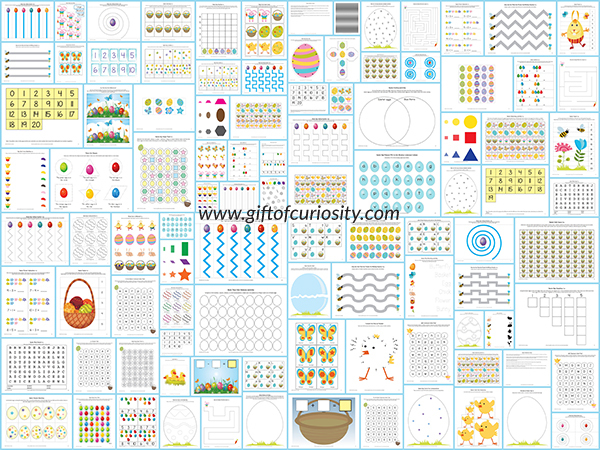 What’s in the Easter Printables Pack? My Easter Printables Pack contains more than 80 Easter worksheets and activities for kids ages 2 to 7. 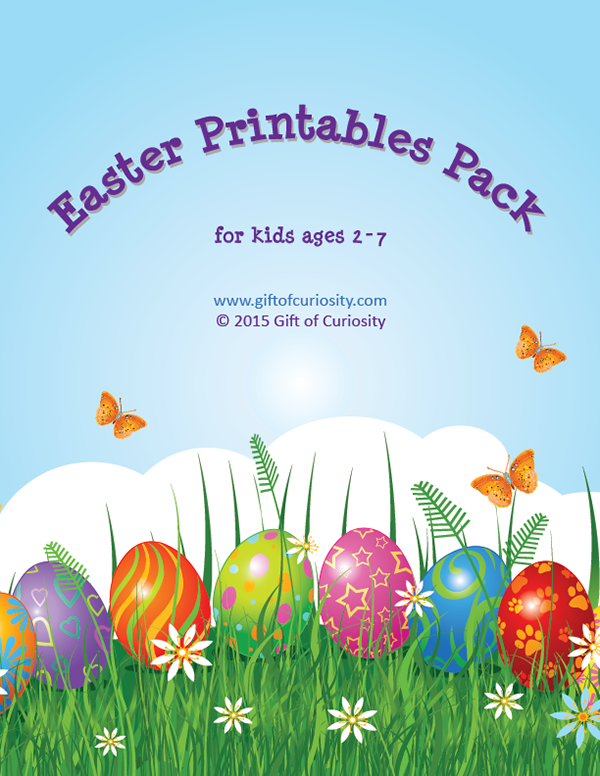 These printables pack all the fun of bunnies and eggs into a variety of educational activities your kids will enjoy. 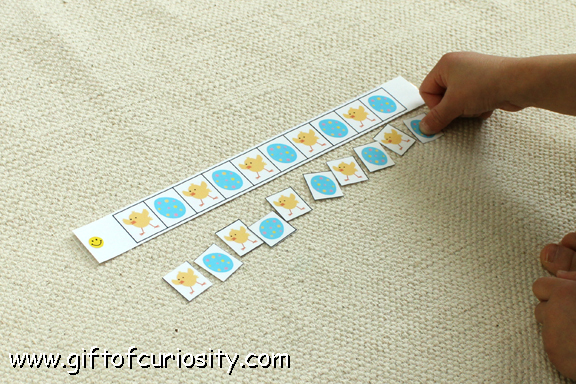 My kids and I have only just begun using some of the activities in my Easter Printable Pack. Below is a look at a few of the things we’ve done. XGirl also worked on patterning. At first she just copied the patterns. But then she also practiced continuing a pattern. 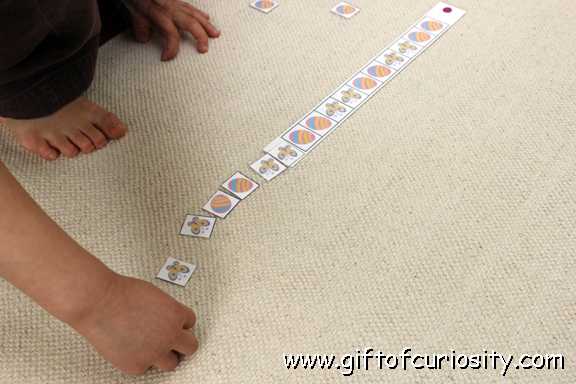 QBoy has recently started to really recognize and be able to count numbers up to about 50. 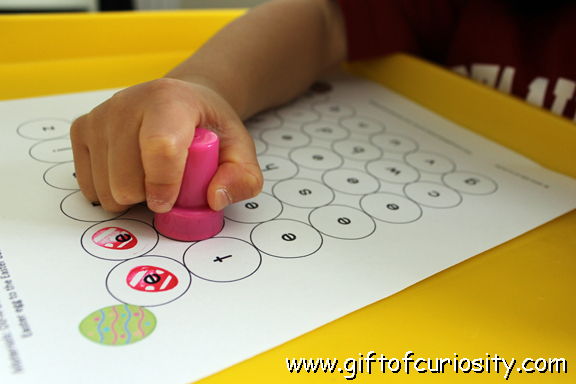 He got to practice some of those skills with this connect the dots by number worksheet. 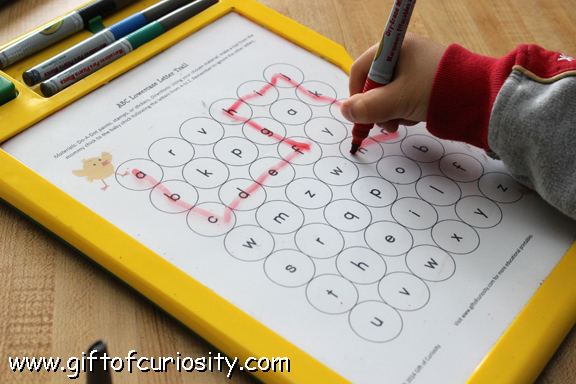 And she did another worksheet to find the lowercase letter ‘e.’ She wanted to do this one multiple times as well, so I was glad I put it into her Crayola Dry Erase Activity Center so she could simply erase and do it again. 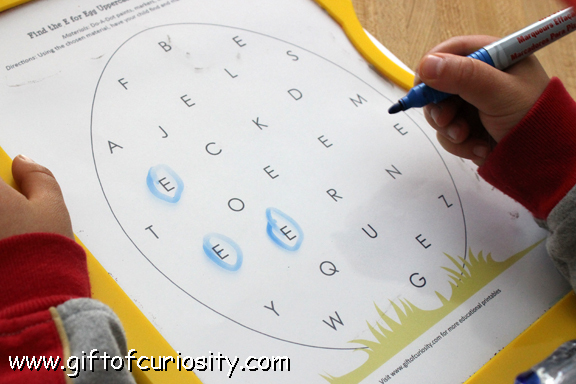 Although he knows his letters already, QBoy didn’t want to be left out so he worked on finding the uppercase ‘E’ on this worksheet. 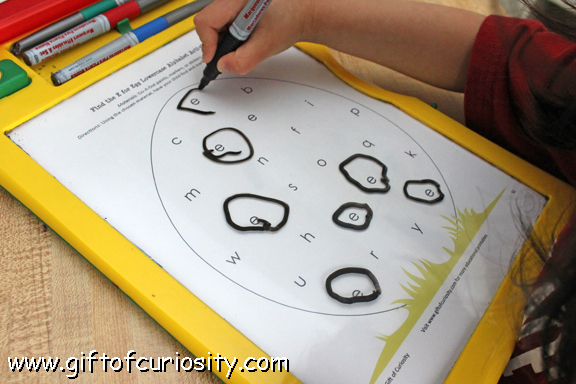 Finally, QBoy worked on alphabetic order with this ABC Lowercase Letter Trail worksheet. 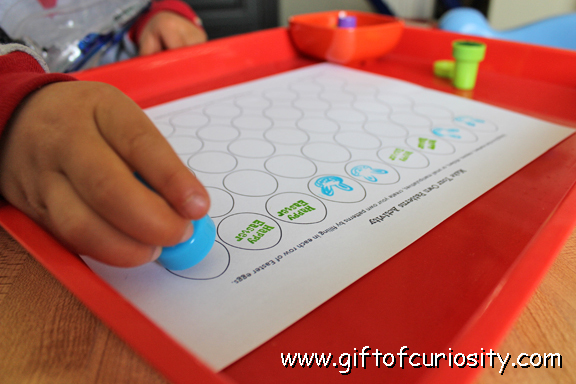 The activities shown above are just a small fraction of the activities included in this pack. Want a copy of my Easter Printables Pack? Thanks so much for sharing this great pack at Mom’s library! I love it! Pinned it! Thanks for pinning and helping spread the word about this resource! That is awesome! Thanks for sharing this Easter activity pack at Mom’s Library. I’m pinning! WOW!! This is great! I am definitely Pinning!! I am starting to gather resources for Easter units and this will be a great addition! Glad you can use it and enjoy! 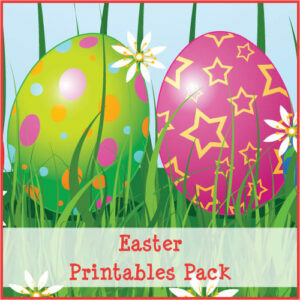 This is an excellent Easter pack, so many activities to keep kids busy. What a cool project! I am sharing it with my Facebook readers. What a great pack! Thank you for sharing at Sharing Saturday! 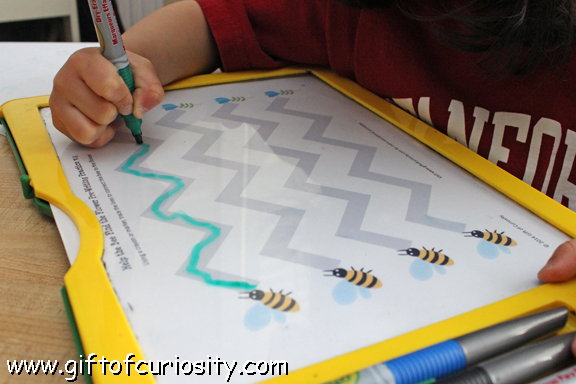 I would love to do these crafts and activities with my homeschooled kiddos! This Easter Pack is wonderful. Thank you for all your time and efforts in putting Pack together. I loveeeeee this pack, thank you. And I am rather loving the Crayola Dry Erase (we laminate everything in this house) … perhaps for Christmas as cannot justify the cost at the moment. ….and I can’t wait for my son to use them!